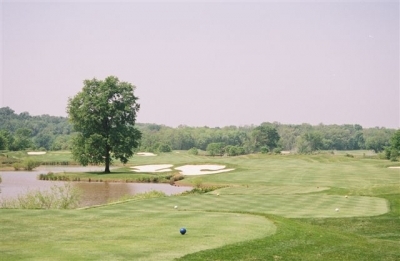 POTOMAC FALLS, VA � When talking about variety in golf design, Tom Fazio says there aren�t any rules � and his work at Lowes Island Club�s Island Course proves it. 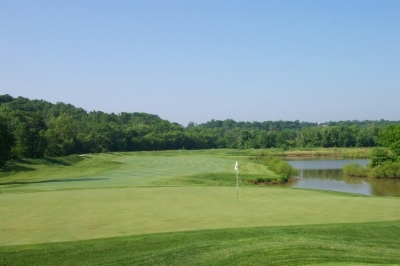 Upon seeing the course, you�ll notice the layout has a couple distinct personalities. 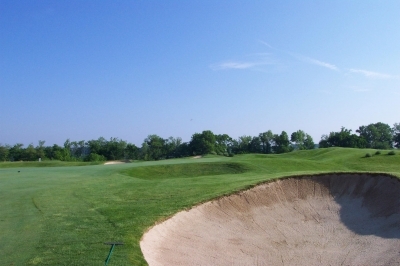 Set predominantly in the floodplain of the Potomac River, several of the Island Course�s holes are rather flat, links-style holes defined by dramatic bunkering and shaped contours dreamed up by Fazio and his associates in their vivid imaginations. Looking back up the hill towards the Lowes Island Club's Clubhouse and the Island Course's 1st tee. Then the course takes a drastic turn, and you�re up in the cliffs overlooking the plain below � very nearly, a mountain-style experience for five holes. And then, you�re back to the flatlands to finish the layout. You�re down, then up, then down again � or, you might say the golf course is uneven and has a split personality. But that�s not such a bad thing. Schizophrenia is a problem with human beings, since we all follow an unwritten code of conduct authored by the mythical Ms. Manners � and having multiple behaviors is not always welcome. But fortunately there�s no such set of rules for golf courses, praise be. Fazio doesn�t mind that Lowes Island�s a non-conformist, because he says the finished layout was a fantastic golf course� and we agree. 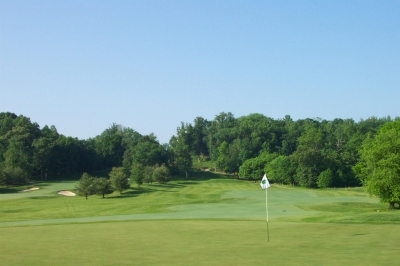 The Island Course may not receive equal mention with some others amongst the Washington DC area�s notable private clubs, but for its members (and those fortunate to be guests), there aren�t any rules when it comes down to playing golf on this unique course and having fun. Just do it, baby. The par five 17th hole, like all of the Island Course's par fives, offers several strategic alternatives. Fazio sees the positive side of the issue, always looking forward and not thinking back, and there�s nothing wrong with any set of golf hole combinations, because that�s what makes golf design so unique. Rule book? Toss it out the window, if indeed there ever was one. Your first hint of the Island Course's split personality comes at the par four 9th. Fazio credits the developer for allowing him to employ that more user-friendly land for golf � which easily could�ve been utilized for housing. But the drama created from using some different topography was well worth it in the end. And despite the fact the flat land where much of the course lies was richly open for interpretation in golf design, it really wasn�t much good for anything else. This view gives you an idea of how Fazio turned 'boring' ground into an attractive, playable golf course -- with dramatic bunkering and creating lakes. 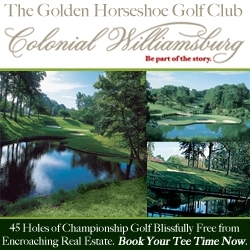 In other words, even if you can�t live there, you can still golf there. A fair trade. From behind the 16th green. This slight dogleg left hole has water up the entire left side -- better leave your hook at home. �I�d say it was in the top 10 most difficult courses I�ve ever designed, and I�ve done over 300 courses now,� Fazio added. But Fazio�s the last one to use boringness or site difficulty as an excuse. When you�re hired to do a job, no one really cares how much you struggle to create something unique and enjoyable. It�s tough being an artist, where the expectations are high and the tolerance of failure is low. 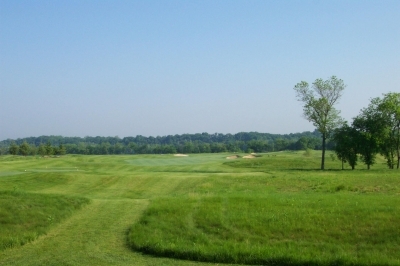 �The members, the guests, the golfers -- they don�t want to hear stories of how hard the golf course was to design. All the so-called �issues� of the site, whether you call them compromises or site conditions � it makes for great cocktail talk, but I�d say, in terms of golf design, that�s what we do for a living, what we�re supposed to do, and what the players expect,� Fazio explained. Danger lurks on the left side of the par three 10th hole -- but the right side isn't much safer. �So you look at the positives that the land offered, and there were many. Being on the Potomac River is certainly a great environment, and we had that wonderful ridge line surrounding the property. We dug some lakes on the flat terrain to provide soil for contouring the golf holes and raising the greens (to help with the engineering issues). Then on the opposite side of the river we had the ridge land, which gave us a new dimension to work with. Finally, with some tree plantings and working with the lake areas � now you start putting all those things together and you�ve got a lot to work with,� Fazio said. Work with, indeed. Now, over ten years later, you�ll never guess of the difficulties in making the course, you�ll just see a beautiful, riverside layout without any houses. It�s very hard to fathom that places like Lowes Island exist anywhere in the Washington, DC area, but seeing was believing. Big bunkers and excellent course conditions -- that's Lowes Island Club's Island Course. In addition to the natural and man-made attributes of the site, you�ll also find some of the best playing conditions around. 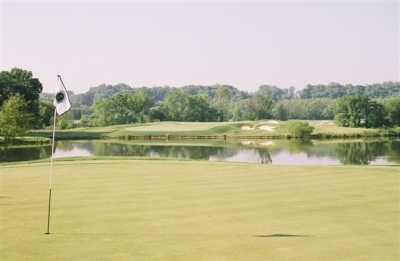 Having visited Lowes Island Club twice now, we�d say the rough�s as thick as it is anywhere in the Washington area. There�s plenty of playing area (as you�d expect with a Fazio designed course), but missing the short grass carries penalties of its own. Kudos to Superintendent Byron Lash � you made our lives miserable in that rough! �He gives you more than generous fairways on the Island Course, and the greens are big targets. But if you get in those bunkers, that�s a penalty. It provides a real strategic quality to the layout, much more than just banging it around on a wide golf course,� Fikac added. If you're going for the par five 8th hole's green in two, hit it high and straight or suffer the consequences. Fazio�s also built in some variety on those large greens, too -- like on the third hole, a 398 yard, straightaway par four. 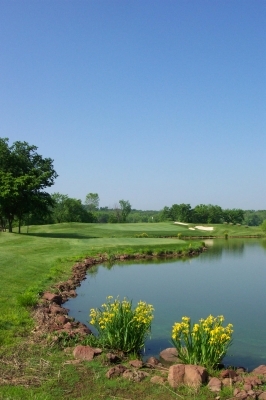 Tee shots must contend with a lake on the right and a bunker bisecting the split fairways, but what�s most unique on the hole is its two greens. 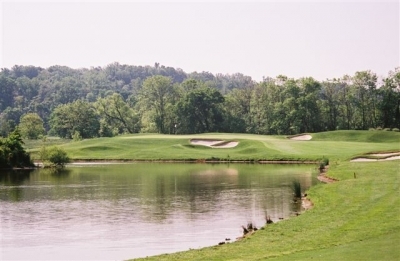 There�s an upper left and a lower right green, the latter playing near the water. Two bunkers separate the greens. Truly, a unique par four � no rules, right? Four�s the #1 handicap hole. 461 yards from the back tees (par four), it requires a long tee shot to one of the narrower fairways on the course, and the approach shot is to one of the Island Course�s smaller greens. If you�re left off the tee you�re in a hazard or blocked by trees, and on the right are some of those deep Fazio fairway bunkers. Nasty hole. Fikac considers the ninth hole the �signature� hole, a 383 yard par four that hints at the Island Course�s change in personality once you�re hitting your approach shot (the backdrop is a hillside). 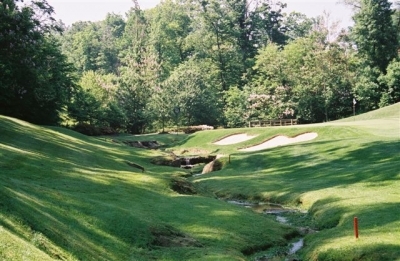 The green is protected by a creek that winds in front, around the left side and in back, and the right side has a large bunker. Beauty and the beast -- some colorful flowers and a 224 yard par three over water (7th hole). The tenth hole is a fantastic par three. 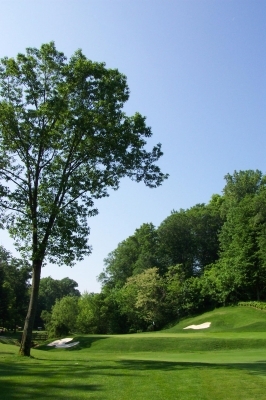 Only 171 yards, the yardage book describes it as the �most dangerous easy hole on the course,� which is very accurate. Again, the creek protects in front and around the left side, and there�s very little room to miss right, too. Twelve offers probably the greatest elevation changes on the course, with a steeply downhill tee shot, then another downhill shot to the green. Missing left on this hole will hurt your scorecard for sure. The par five 2nd hole is certainly links-style in feel. Which goes to show, there are no �rules� when visiting Lowes Island Club � just as there weren�t any when building the Island Course. But the good time you�ll have is just right, all the same. Memberships are available. Contact Mary Jo Hoskyns at (703) 444-4801, x: 103 for inquiries.